"I deleted some useless text messages on my Samsung Galaxy S6 yesterday. I always do this to keep my text messages clean. But I can't find the messages history with one of my friends. I think I deleted them yesterday along with other SMS. How can I recover deleted text messages on Android? Thanks in advance!" Many other Android users meet this problem that deleted important text messages on Android phone and want to get them back. When you deleted your text messages from Android phone, the messages are not deleted completely. You can still retrieve them from your Android phone. In this article, we will show you how to recover deleted text messages on Android phone. Better news than that, the software is FREE. 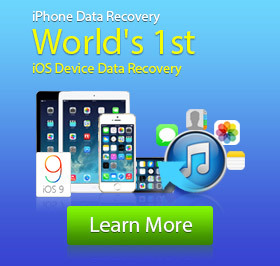 Android Data Recovery can work as an Android SMS Recovery. 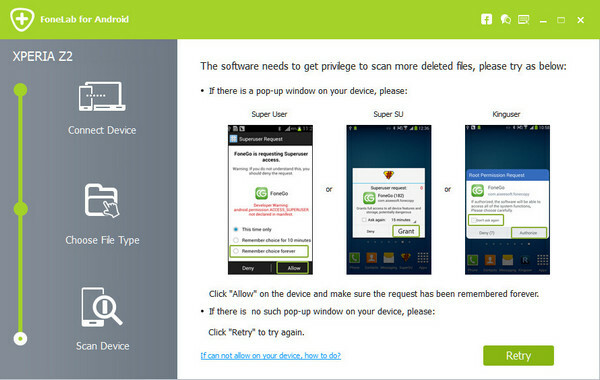 It can scan your Android phone, find the deleted text messages and recover them for you easily. 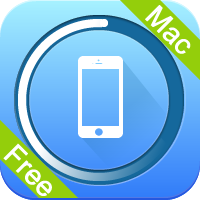 It can also recover deleted contacts, call logs, notes on your Android phone easily. 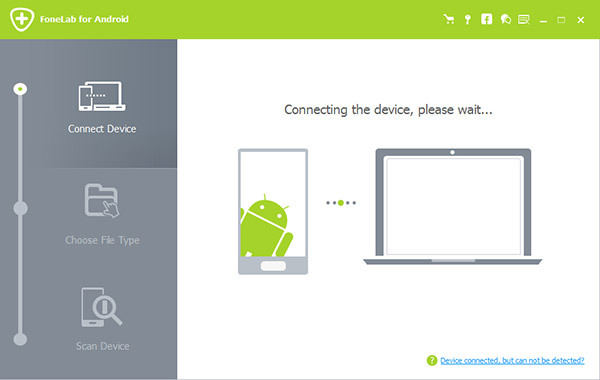 It supports Samsung, HTC, LG, Sony, Moto and other popular Android brands. Free Download, install and run the recovery software on your computer. Connect your Android phone to your computer via USB cable. The software will connect your Android phone to it automatically. 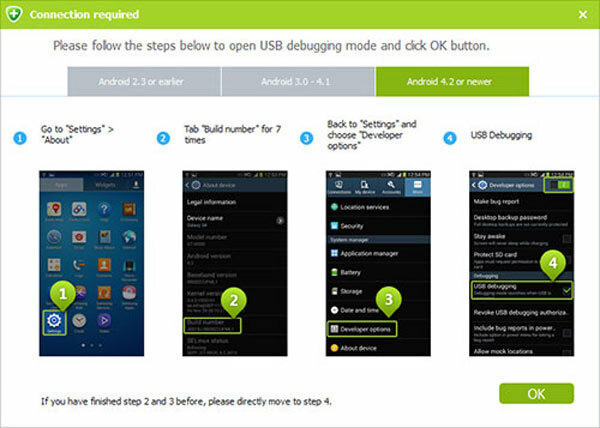 To fully access your Android phone, you need to enable the USB debugging mode on your Android phone. Different Android versions have different ways to enable it. You can easily follow the guide on the interface. For Android 2.3 or earlier: Enter "Settings"> "Applications"> "Development" > "USB debugging". For Android 3.0 - 4.1: Go to "Settings" > "Developer options" > "USB debugging". For Android 4.2 or later: Click "Settings" > "About phone". Tab "Build number" for 7 times till the dialogue box "You are under developer mode" occurs. Then return to "Settings" > "Developer options" > "USB Debugging". Once you enable the USB debugging mode on your Android phone, you are allowed to select the data type you would like to scan on your Android. If you just want to recover deleted text messages, you can only choose "Messages". 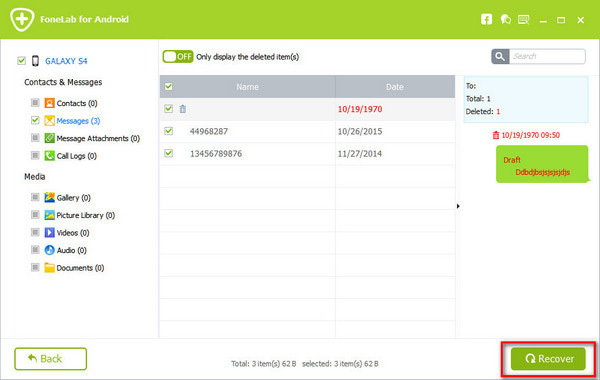 If you would like to scan and recover other data, you can choose them as you want. Before you can get back your deleted text messages, the software needs to get Privilege to have the permission to scan your Android phone. You can easily go to the screen of your Android phone and click "Allow/Grant/ Authorize" on the screen. After that, the software will scan your Android phone to find the deleted text messages and other data on your Android phone. Before recovering deleted text messages from Android, you can preview the text messages easily with the software. Just go to the "Messages" section and click the text messages you want to preview. You can see the detailed information of the text messages on the preview window. 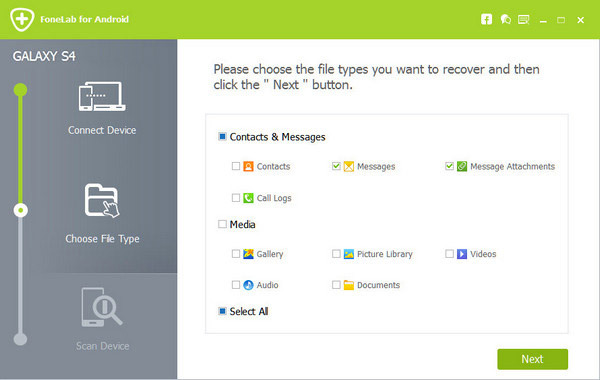 Select the text messages you would like to retrieve and click "Recover" button. All the text messages you selected will be recovered and saved to your computer. With this Android Data Recovery, you can easily recover deleted or lost text messages and other data on your Android phone. Though you can recover deleted data with this software, you'd better back up your Android phone regularly to avoid losing important data. Want to Recover Deleted Android Contacts? Here Is The Way! Copyright © 2016 freeiphonedatarecovery. All Rights Reserved.